ATEX & IECEx certified (Zones 1+2) IBC heater for containers up to 1000 litres. This Ex-rated IBC heating jacket is used throughout the world in a multitude of industries from pharmaceutical to chemical, cosmetic to food, the IBC heater is the ideal solution for heating liquid materials stored in intermediate bulk containers. 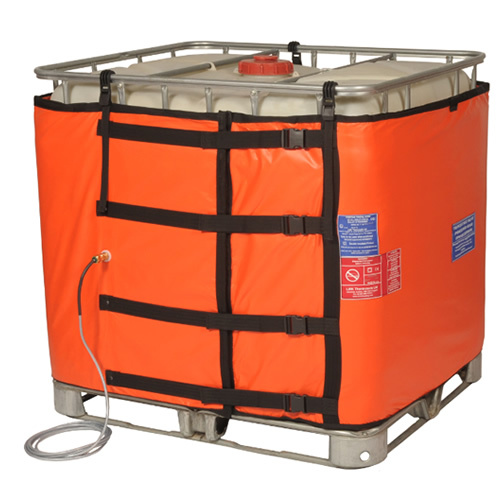 With 1000 watts per zone and an optional insulation lid the heater jacket offers a cost effective way of heating IBC's. This Ex-rated heating jacket is designed to heat products stored in 1000 litre intermediate bulk containers. The IBC is an insulated heater jacket, which covers all four sides of the IBC and has an optional insulated lid. Constructed with patented technology using carbon rich semi-conducting heating membranes, safe operating conditions are maintained even in the presence of potentially explosive gases. Temperatures up to 65°C can be achieved using 220/240v. No transformers are required as the unit can operate from any 110v/240v ac supply.